A light haze from cigar smoke wafts through the room. MICHAEL, a contributor to the BEASTPODE BLOGE, sits in a high-backed red chair. A half-stump of a cigar is in his left hand and a glass of single malt, neat, is in his right. MICHAEL looks away from the TV on the other side of the room. Oh, hello there. Didn’t see you walk in. Please, sit down. Sit. The camera lowers, as if sitting down. Well, I hope you’re excited; the Seattle Seahawks’ first preseason game is this week! You’re excited, right? The camera bobs up and down, as if nodding. It’s against the Colts! Oh man! Andrew Luck may or may not throw a pass but will still get more praise on the broadcast than Russell Wilson! The national media, amirite? Anyway, you probably don’t really even care who the Seahawks are playing, right? It’s the preseason, right? So you’re probably more worried about the Seahawks players; who is starting, who is at the bottom of the 53-man roster, who is fighting to try to make the team. MICHAEL takes a draw of the cigar and slowly exhales. BUT! You haven’t gone to every training camp practice and you aren’t Extremely Online and probably have more productive things to do with your valuable time than follow a game. I totally get that. HOWEVER! You enjoy watching Seahawks games, even ones that don’t count! And you enjoy watching them with others and you also enjoy looking like a Very Smart Knower Of Things. You want to know who on the Seahawks roster you can point to as a Good Player. I also get that and it’s why I’ve invited you into my study this evening…. MICHAEL takes a long pause and takes a swig from his single malt. MICHAEL lets out a performative, content sigh. Oh man, that’s the good stuff. I’ve invited you into my study to tell you which Seahawks players to stan for, to ride or die for, to pound the figurative, if not literal, table for. And now, here’s a PowerPoint. MICHAEL sets his single malt on the armrest of his chair and produces a clicker from the inside breast pocket of his smoking jacket. MICHAEL points the remote at the TV and clicks. So our first stan candidate, or should I say STANDIDATE, is JAMARCO JONES. JONES was a fifth-round draft pick by the Seahawks this year. I know what you’re thinking, “Hey, MICHAEL, didn’t the Seahawks only draft a running back, SHAQUEM GRIFFIN and a punter?” There are, in fact, more! JONES is a tackle from Ohio State and, with the continued struggles by GERMAIN IFEDI in camp, JONES has been taking first-team snaps at right tackle. He might not be athletic, but he had the 14th best Pass Blocking Efficiency in the country last year, per PFF. It will be interesting to see if he starts on Thursday and how well he performs, starting or not. I’m on the JAMARCO Hype Train and you should be too. We stan a right tackle. MICHAEL takes a drag from his cigar and presses the clicker. The next STANDIDATE is POONA FORD, an undrafted rookie out of Texas. The defensive line is a very, very shallow position for the Seahawks’ defense this season. 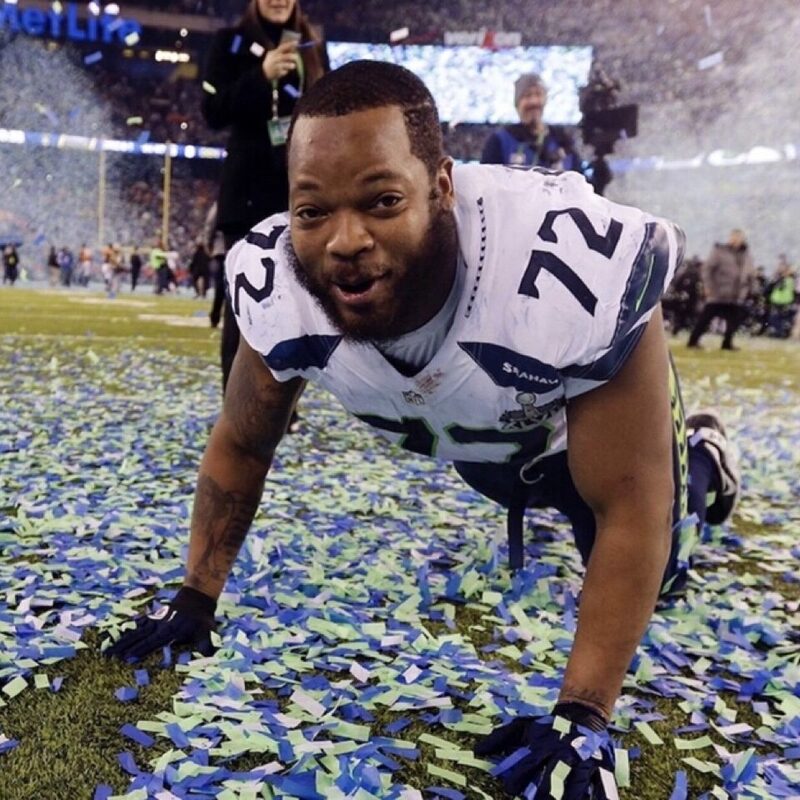 Michael Bennett was traded for not using an audio book. Sheldon Richardson wasn’t worth $8M dollars, apparently (Editor’s Note: I’m still furious). There are plenty of question marks outside of Jarran Reed and Nazair Jones. Enter POONA FORD, who impressed at the Seahawks’ scrimmage this weekend. FORD has an uphill battle to make the roster but, if he can ride his training camp hype train into strong preseason performances, FORD just might squeak into the 53-man roster. We stan a defensive tackle. MICHAEL puts the stub of his cigar in the corner of his mouth and picks up the glass of single malt. He pushes the clicker. Alright, next up on our STANDIDATE list is CHRIS CARSON. Surprised? Well, don’t be! The Seahawks had a horrible running game last season. CARSON was dynamic in his limited time as starter early last season, cementing a narrow win at home against the 49ers. Since then, the Seahawks drafted a running back in the first round. CARSON has a bit of an uphill battle to come back from injury and defend his starting job from an exciting young rookie. However, he’s shown out in training camp, so it will be exciting to see him get a full set of live-game reps with the first team offense on Thursday. Also, this guy rocks a hoodie in practice like no other. He even broke practice equipment! He does it all! CHRIS CARSON: officially back, baby. We stan a running back (unless you’re Ben Baldwin). MICHAEL takes a very generous swill of his single malt with the cigar in his mouth. He tries to fight off some coughing, having overplayed his hand a bit. He quickly presses his clicker to distract from the light choking. Woo, boy. That’s (cough) the stuff right there! Alright, next up! STANDIDATE: MICHAEL DICKSON. I see that look. A punter, you ask? Damn skippy, sir! Isn’t JON RYAN still a Seahawk, you wonder? You’re right about that, too. Smart kid….yes, I can tell you’re thirty. MICHAEL DICKSON, who I should note, is an Honorary member of the Mike Hive, has been lauded as one of the greatest punters in collegiate history. Ya know how golfers can just use a metal stick to make a ball fly and land in whatever way they want? Well, this kid can do that with his leg and a football. I have and will continue to stan for JON RYAN and his NFC Championship double-check but he didn’t have the best year in 2017. If you really, truly want to impress your friends, then by gosh by golly get them on the punter hype train. We stan a punter. MICHAEL turns off the PowerPoint with his clicker and takes one last drag of the now-small cigar. He slowly, deliberately exhales the smoke. Well, kid, that should get you started for now. Those four Seahawks young guns should be exciting to watch and even more exciting to stan for. Please, feel free to take a mint on your way out. MICHAEL gestures broadly at the desk to his right.